Americans are more familiar with the names tapioca root, cassava or manioc---all are common names of the tropical plant Manihot esculenta. Mexicans call this plant, or more specifically the fleshy root, "yuca." Intolerant of subfreezing temperatures, it grows best in warm, sunny garden locations in a moist, sandy soil enriched with organic matter like compost. Over a long growing season, the underground tuber (firm but fleshy underground stems) enlarge. They can be dug up and immediately used for meals since they do not store well. Yuca root is rich in starch and should be peeled and twice-boiled in water to remove the poisonous hydrocyanic acid before serving for a meal. Plant the cassava in a sandy, well-drained garden soil when there's no danger of frosts or freezes. It appreciates lots of sunshine---at least six hours of direct sun daily. In hot or arid conditions, midday shade in the heat of the summer is recommended, according to Floridata. Cassava plants need at least eight months of frost-free growing before its tuberous roots become large enough to warrant harvest. Irrigate the sand-based garden soil to keep the soil evenly moist, but never soggy. Supplement natural rainfall as needed to provide one to three inches of water weekly from spring to fall to keep the plant from prematurely wilting in the heat. 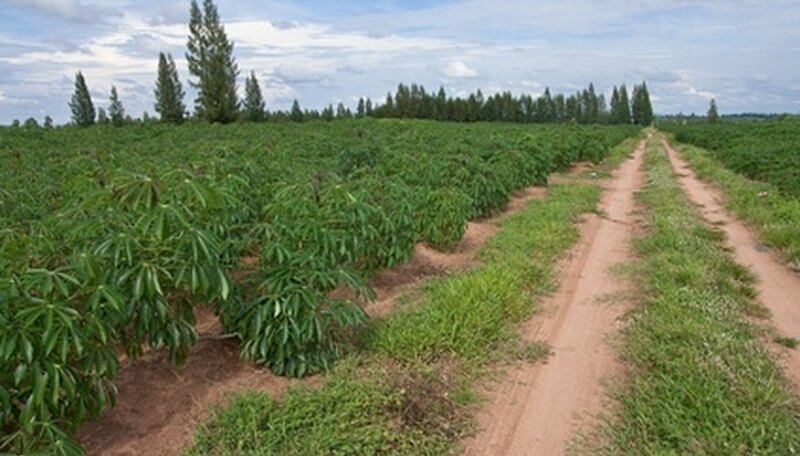 Cassava plants are extremely drought tolerant, but watering the plants encourages healthier and faster growth. This ultimately leads to larger tubers to harvest later. Dig up the tubers of cassava with a garden shovel after the plants have grown for at least eight months. Carefully pierce into the soil about 12 to 18 inches away from plant stem bases and lift the shovel blade. This diminishes chances of cutting into a tuber and helps you better seed the root system during the harvest. Wash off lingering clumps of soil from the tubers with water and allow them to air-dry. Use the tubers, called yuca, within a day after harvest. Do not consume any part of the yuca until it has been peeled and appropriately boiled to remove toxic compounds. Peeled yuca roots submerged in water in the refrigerator or frozen will store for three to four months, according to the Center for Disease Control's website Fruits & Veggies Matter. Cassava plants are propagated in the warm months from cuttings of their branches, not from seed. They are best cultivated outdoors in US Department of Agriculture hardiness zones 8 and warmer. In USDA zones 8 and 9, light winter frosts kill back foliage to the ground; it re-sprouts from the roots in the spring. In USDA zone 10 and warmer it becomes a large evergreen shrub. If you live in a region that doesn't have at least an eight-month growing season with warm temperatures, grow cassava in large containers and move them indoors when frost threatens. This lets the plants grow large and long enough to produce amply sized yuca tubers for a harvest. Raw and undercooked yuca root tubers are highly toxic. North Carolina State University lists that the fresh, unprepared yuca contains lethal levels of two cyanogenic glycosides named linamarin and lotaustralin. Discard peelings of the yuca roots where children will not access them or dare to chew on them.